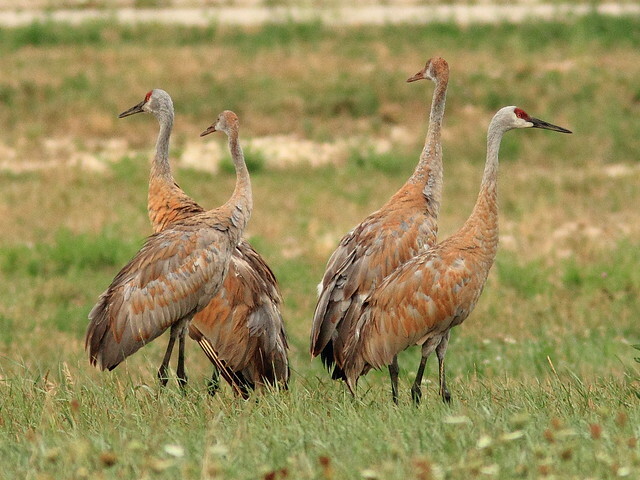 This family of Sandhill Cranes visited our front yard several times over the past month. The two colts lack the red on their foreheads. 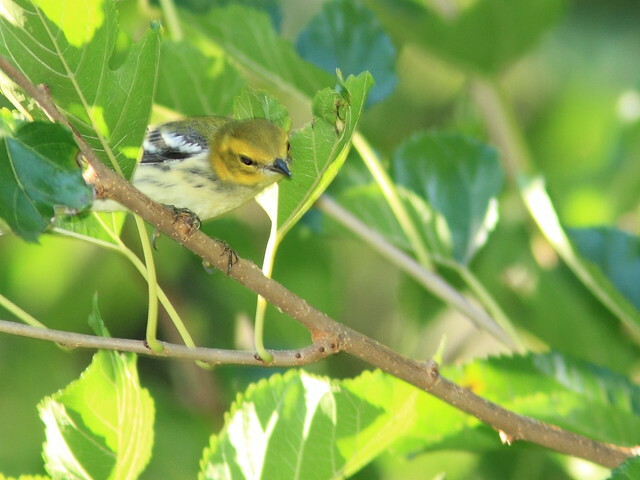 Earlier this month, the weather radar showed that migration had continued into the morning. Our condo is located a few miles east of the Interstate 88 highway logo on the maps, below. 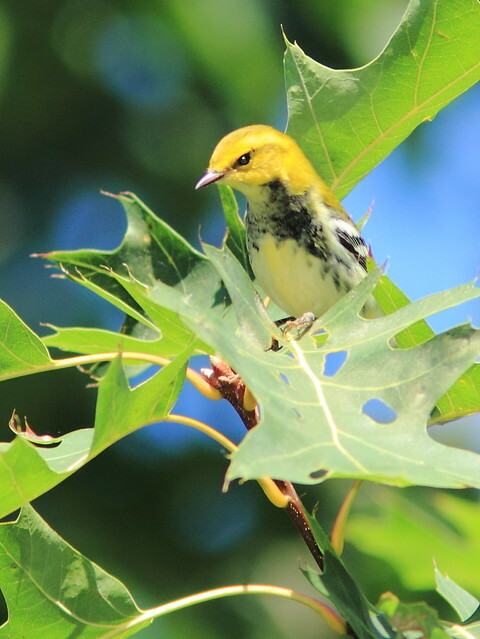 With visions in our heads of warblers dropping out of the sky, Mary Lou and I set out to visit Bliss Woods Forest Preserve, a 10 minute drive from our second home in NE Illinois. This was the Chicago radar display on September 6, 2012, at 5:33 AM. Skies were clear and there was only a slight breeze from the southwest. The velocity image shows that targets were moving from north to south despite the prevailing wind pattern– quite a biomass of migrating birds. 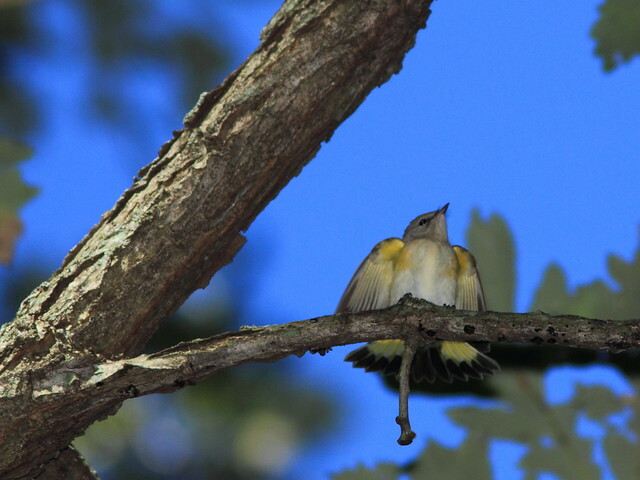 Although we had heard about good birding in this small preserve, this was to be our first visit. 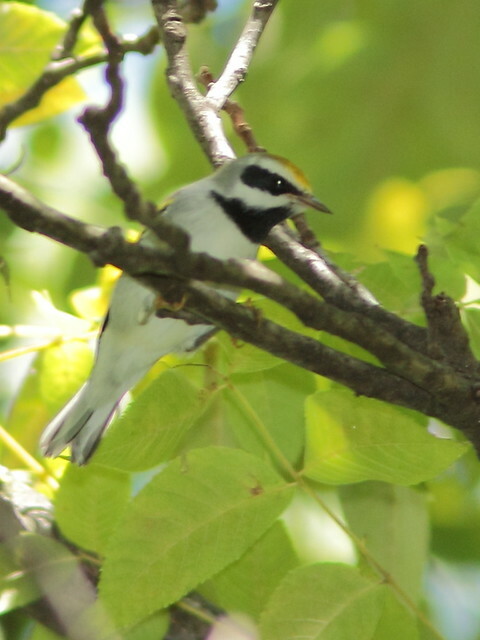 We found a nice variety of habitats, from patches of prairie to mature hardwood stands. 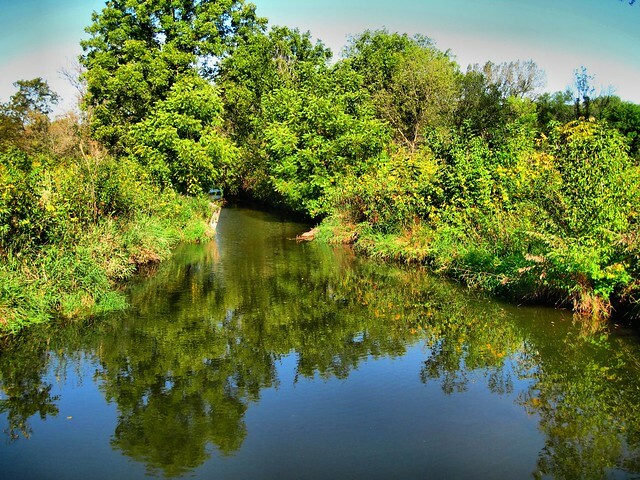 A creek crosses the bottomlands. 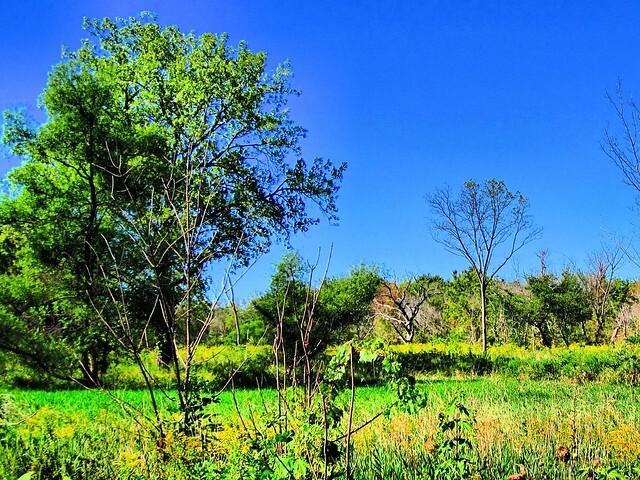 Trails are paved and provide access to some nice viewing areas, such as this savannah. 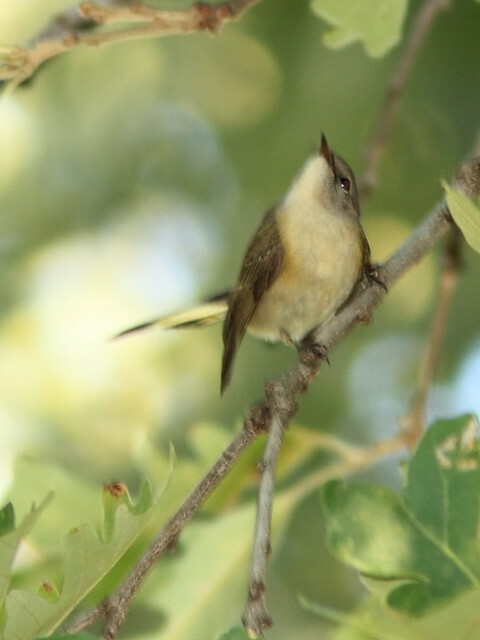 We immediately found a flock of about a dozen warblers, mostly Black-throated Greens. 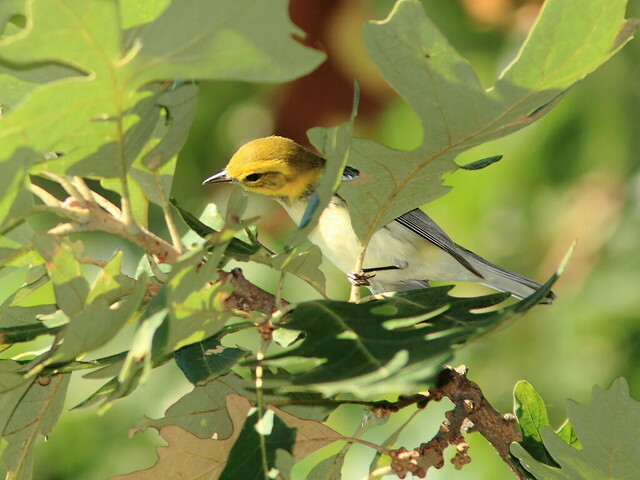 They weaved in and out of sight among the leaves of a large oak tree. 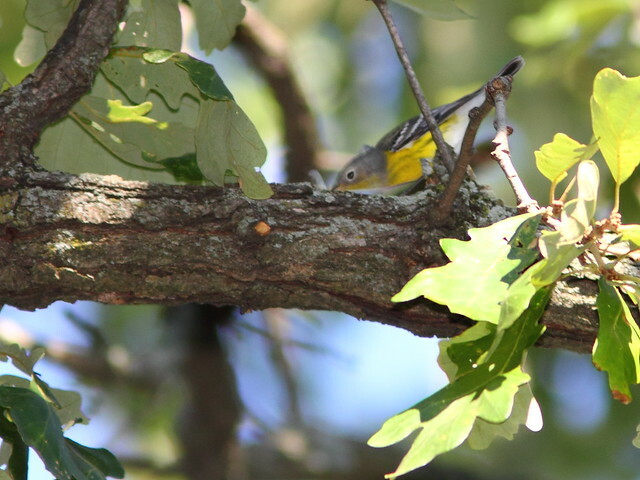 I captured this poor photo of a Magnolia Warbler. 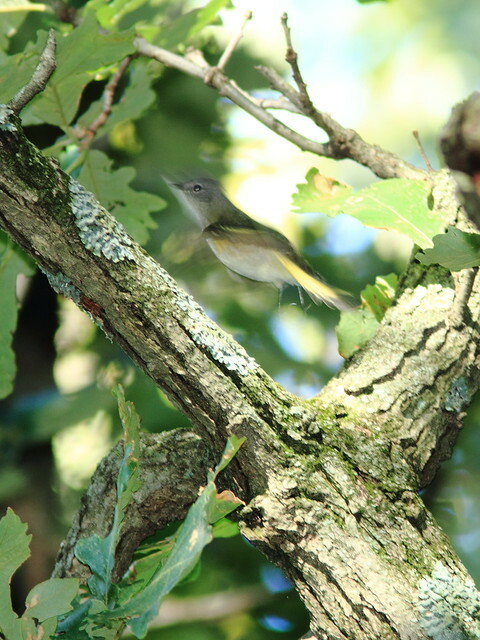 There were also several American Redstarts flitting about, almost impossible to catch in the camera’s eye. 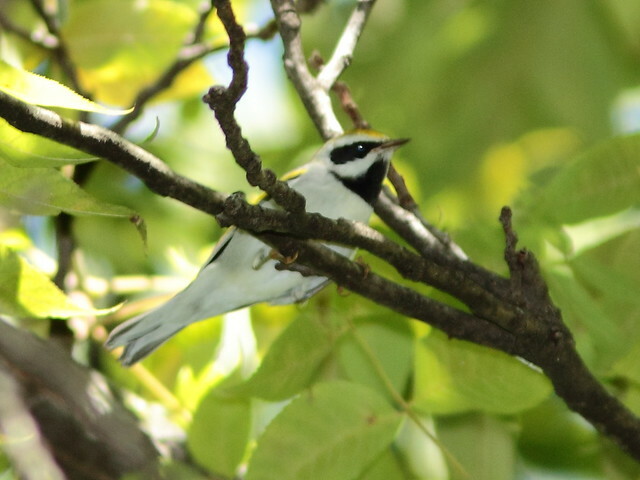 Although I had previously seen Golden-winged Warblers, they provided me with my first images of the species. 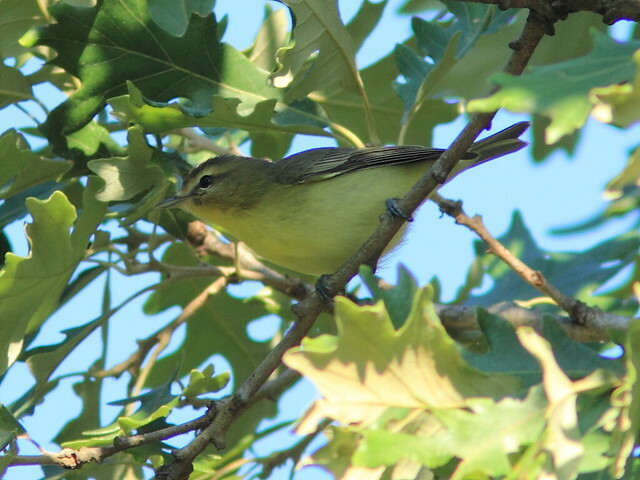 Among the non-warblers, my first-photographed Philadelphia Vireo was a prized find. 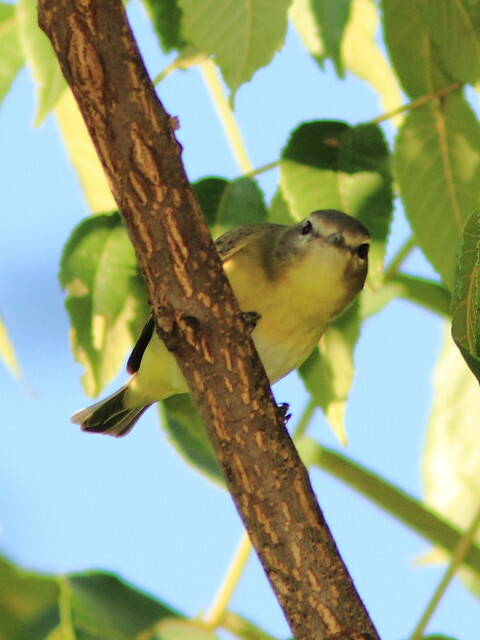 This view shows the dark marks that extend through and in front of the Philadelphia Vireo’s eye, which along with its brighter yellow underparts, distinguish it from the more common Warbling Vireo. 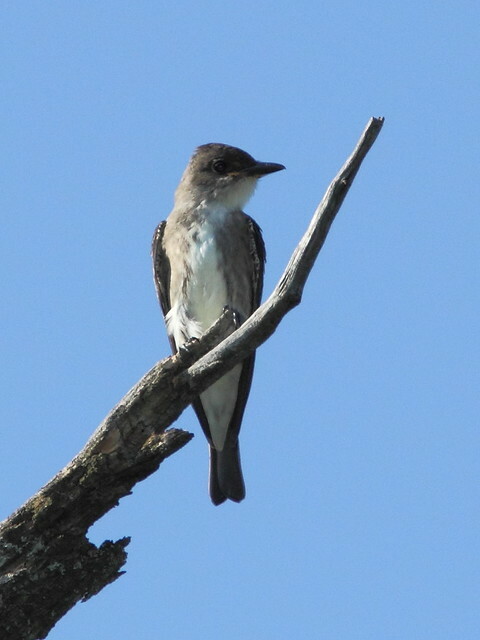 Another fairly uncommon migrant bird was this Olive-sided Flycatcher, roosting high atop the bare branches of a dead tree. 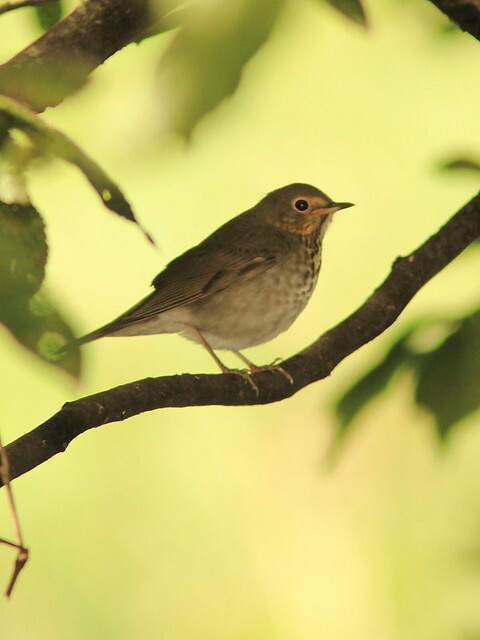 We saw several southbound Swainson’s Thrushes. 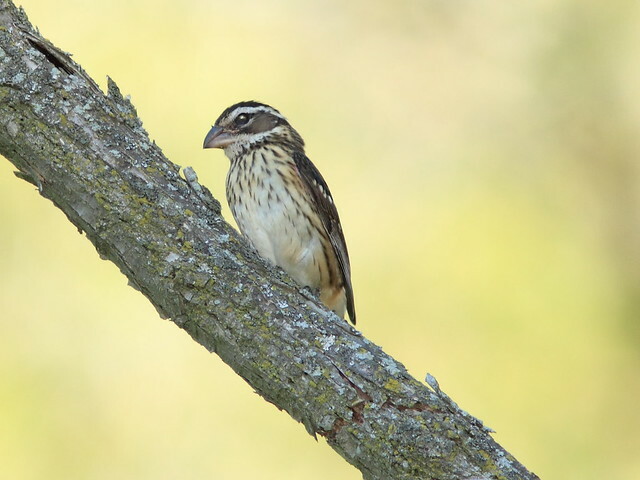 An immature Rose-breasted Grosbeak posed nicely. 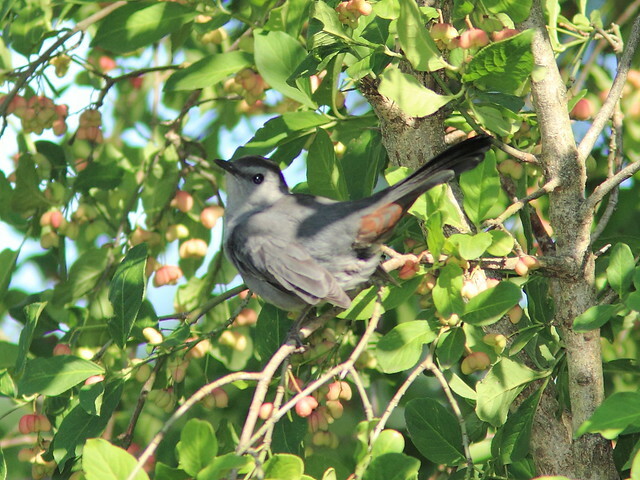 A Gray Catbird showed off its rust-colored crissum. 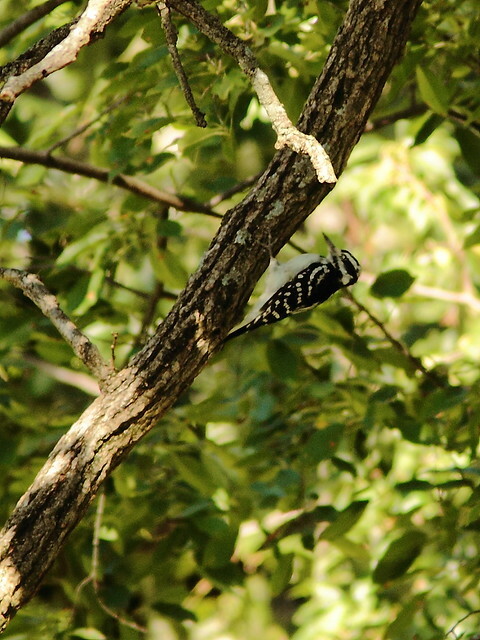 A Hairy Woodpecker, distinguished from the smaller Downy Woodpecker by its relatively longer bill and lack of barring on its outer tail feathers, foraged on the trunk of a small tree.